Jemea I. Thomas (born April 7, 1990) is an American football cornerback who is currently a free agent. He was drafted by the New England Patriots in the sixth round of the 2014 NFL Draft. He played college football at Georgia Tech. A native of Fitzgerald, Georgia, Thomas attended Fitzgerald High School, where he was named the 2008 AJC Class AA Defensive Player of the Year. As a senior in 2008, he rushed for 518 yards on 59 carries (8.8 yards avg) and seven touchdowns. Defensively, he had 140 tackles with three blocked field goals and four interceptions.Had Jersey retired. Considered a three-star recruit by Rivals.com, he was rated as the 36th best athlete prospect of his class. 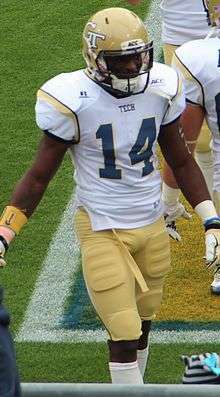 Thomas attended Georgia Tech and played for the Yellow Jackets from 2009 to 2013. As a true freshman, he appeared in all 14 games in a back-up role, recording 10 tackles, a fumble recovery and a pass break-up. In 2010, he was redshirted due to the depth of the safety position. In 2011, Thomas returned to action to play in all 13 games, including two starts. He recorded three interceptions, which led the team, 50 tackles, including four for loss and two sacks. In 2012, he started all 14 games, and ranked second on the team in tackles with 86, and first on the team in interceptions with four. In 2013, he played and started in all 13 games, and led the team in tackles (88) and pass break-ups (8). He also added two interceptions and two forced fumbles. He was selected by the New England Patriots in the sixth round (206th overall) of the 2014 NFL Draft. On May 18, 2014, the Patriots signed Thomas to a four-year deal. He was released on August 26. On August 27, 2014, Thomas was claimed off waivers by the Dallas Cowboys. On September 1, he was cut and signed to the practice squad one day later. He was released on September 16. On September 19, 2014, the St. Louis Rams signed him to the practice squad. On October 25, he was promoted to the active roster. On October 29, he was released and re-signed to the practice squad 2 days later. On December 3, 2014, he was signed by the Tennessee Titans from the St. Louis Rams practice squad. He was released on September 4, 2015. ↑ Rowan Kavner on Twitter: The Cowboys got cornerback Jemea Thomas (6th round/G-Tech) off waivers from New England. Waived WR Tim Benford. ↑ George, Brandon. "Dallas Cowboys officially sign LB Korey Toomer, cut DB Jemea Thomas". Dallas Morning News.